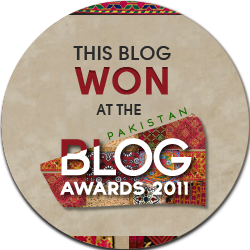 Thrilled to receive the Best Blog from a Journalist at the Second Annual Pakistan Blog Awards 2011. Thanks to all those who voted and helped make it possible 🙂 Congratulations to all the other winners. Note: There are many other blogs from Pakistan that could have been in the running but didn’t nominate themselves. One expects there will be more and more competition as the Blog Awards become better known and more established. This is acknowledgment of a fact. I too think your blog is one of the best. Felicitations and all the best for the next year. Thank you. That is too kind. Best wishes to you also and all other readers for this holiday season and the coming new year. That is great. Well done! Always very informative. Congratulations Beena! best wishes for the new year ahead.